LIMITED & NUMBERED EDITION OF ONLY 1000 PIECES WORLDWIDE! Black carbon fiber bezel with Microblasted recessed zones. The bezel is secured by 6 black PVD coated "H" style screws. Black composite resin case center lateral edges & bezel lugs. Time adjusting crown at the 3 o'clock position - brushed black PVD coated titanium with black & grey rubber insert. Chrono stop button at the 4 o'clock position - brushed black PVD coated titanium with polished black PVD titanium top. Raised flange located beneath the crystal at dial edge. 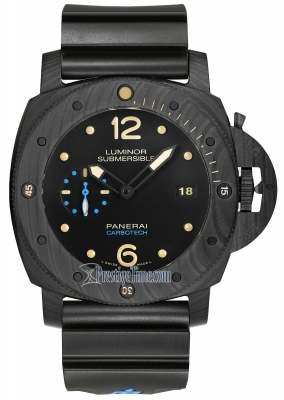 Matte black finish with bold black luminescent indicators (Arabic Numerals, dots & indexes). The bezel is operated using the over-sized crown located on the case edge at the 10 o'clock position. The crown features a hinged black PVD coated Crown-Guard protecting & identifying the bezel-crown. Helium escape valve locate on the case edge at the 8 o'clock position. Bold yellow & black luminous dot hour markers. Yellow & black luminous printed minute/seconds track. Brushed finished black coated stainless steel hands with blue colored luminescent fill. Bold yellow 30 minute central counter hand. 30 minute counter segment on dial in blue. Date window located between the at the 4 & 5 o'clock positions. 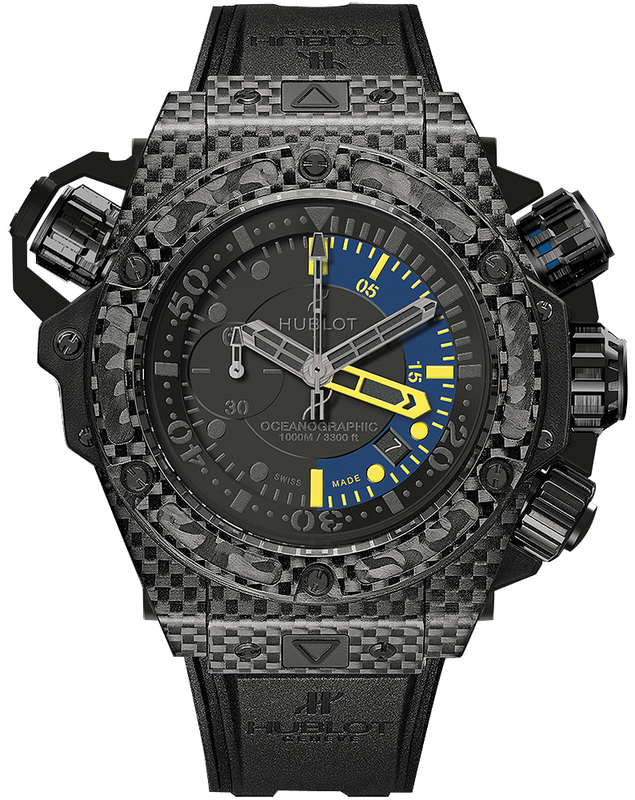 Comes with an addition LONG rubber and nylon composition strap to fit over a diving suit. The straps are easily interchangeable by pressing firmly on slightly recessed buttons located on the face of the top & bottom lugs - the buttons are marked by triangle arrows. Hublot Caliber HUB4160, beats at 28,800 vph, composed out of 234 parts, contains 25 Jewels & has an approximate power reserve of 42 hours.